Puget Sound Rescue relies on donations to operate. Please consider making a PayPal donation today! Puget Sound Rescue is a non-profit organization dedicated to animal rescue. We have been saving dogs for the past 20 years in the south King County area, and have found loving homes for over 4,000 dogs that were at risk for euthanasia. There are many ways you can help: adopt a dog, foster a dog, donate funds or items, or volunteer your time. Please see our dogs available for adoption. We are located between Auburn and Black Diamond, Washington. We are not a shelter, and our dogs are available for meeting and greeting by appointment only. Please fill out our online adoption application to be considered for adopting a dog from our rescue. Please e-mail us at pugetsoundrescue@hotmail.com with all other inquiries. Note: We do our best to respond to emails on a timely basis, but as we are a 100% volunteer organization - we often get behind. Please be patient or try us again if you have not heard back! Follow us on Facebook Puget Sound Rescue! Follow us on Instragram @pugetsoundrescue! Meet Hope. Five years ago, we rescued her from being euthanized and adopted her to a wonderful forever home. 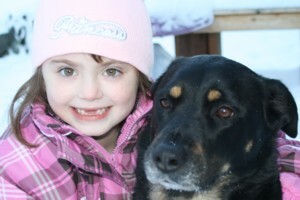 She is shown here with her loving owner McKenna, on Hope's fifth (adoption) birthday. © Copyright 2018 Puget Sound Rescue.